The Bang-Bang Boys are a relatively new comedy team made up of absolutely wonderful seasoned performers. In the late 1980s Jean-Michel Paré and David Aiken discussed doing a show together. The idea was a powerful one because both were already strong buskers with reputations for delivering laughter by the ton. As it was that plan was sidelined for about a quarter of a century as they both pursued incredibly successful careers performing around the world –Jean-Michel as half of the legendary team “The Flying Dutchmen” (the-flying-dutchmen.com) and David Aiken as “The Checkerboard Guy” (TheCheckerboardGuy.com). In 2013 while both were performing at the Pohang Performance Arts Festival in South Korea, they were sitting in front of a shop called Bang-Bang and Jean-Michel suggested that they do what they’d discussed so long ago. 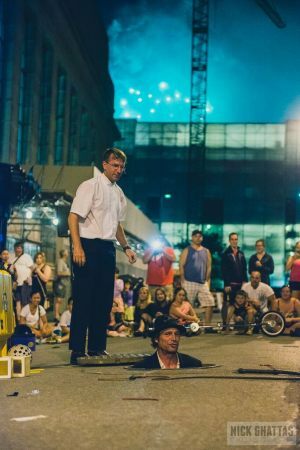 A year later, the chance came to collaborate for audiences at the 2014 Ottawa Buskers Festival. A string of busker fest successes have followed and the Moisture Festival is happy to be in line and to bring these guys together for Seattle audiences. Bang!